Vehicle cargo carriages are special tools that you mount on top, rear or at the front side of your vehicle to increase its carriage capacity. Carriages come in different design all meant to increase ease of installation and capacity. Most of these tools are made of steel and feature a carbide powder finish for durability. Additional features of cargo carriages include a light system, folding ability and mesh design for ease of washing. The carriages come at different prices depending on the features and size. A vehicle cargo carriage is ideal for those who like carrying large or heavy valuables. Also, those who love camping, having roadside trips, tailgates or bulky shopping, will find a carriage very helpful. If you don’t want to inhale the smell of your cargo or if your car has a small interior capacity, you may want to consider a cargo carriage. You require a cargo carriage to allow you carry large valuable at once. It also lets you carry your cargo in a safe way. This tool offers you a way to increase the carrying capacity of your car while traveling. What exactly does it do for you? A cargo carriage mounts to your vehicle to allow you carry your valuables conveniently. You can use it to carry toys, travel bags, and camping accessories. Some carriages come with a lighting system that enhances the convenience of carrying your valuables through dark or unclear roads. The ROLA Cargo Carrier has a sporty look and high capacity to meet your travel needs. It measures 56 by 23 by 5.25 inches to ensure a compactness yet offering a huge carriage space. The curved hitch mount design is meant to improve ground clearance and also for easy installation. Rise shank helps to elevate the cargo platform above exhaust outlet to avoid contamination. This feature allows you to carry precious cargos since you are sure they won’t be exposed to the cars exhaust gasses. 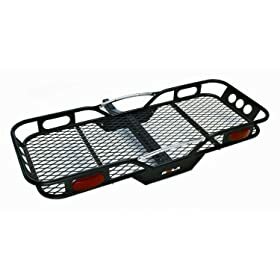 With the attachment points, you can relocate your vehicles license plate. The attachment points come in handy when you want to transport a relatively large cargo. You can choose an optional fully functional lighting system for the carriage for convenience when traveling at night or in dark places. If you want to get a lighting system, there are two options available, the LED #59516 or Incandescent #20174. The steel construction and black powder coating are meant to make this carriage durable. If you choose this brand, you will enjoy a 5-year warranty. The ROLA Cargo Carrier is ideal for use with a variety of vehicles, and it offers a large cargo capacity. It’s easy to install and provides great ground clearance. If you desire to travel longer distances at night or in dark paths, you can choose this carriage plus an optional system light. The CURT is made of high-strength tubular steel for durability. The black carbide powder coat finish is meant to enhance its durability. It has a carrying capacity of 500 pounds to accept a variety of cargo including travel bags and toys. You will appreciate the 6-inch tall side design that aims at keeping your cargo more secure during travel. The basket style is meant to increase the capacity of the carriage as well as ensure the security of your variables. You will realize that the rear hatch opens and closes to offer plenty of clearance despite the weight of the load. It continently mounts in any 2-inch by 2-inch receiver hitch. Thus, you can use it with a variety of vehicles including Nissan Pathfinder, SUV, Hyundau Santa and even for a minivan. Installation of this carriage is simple. All you need is to fix a few bolts/nuts, and you will be ready to ferry your valuables. You can even install it alone. If you want to carry a large cargo in a secure way, you may want to try this cargo carriage. It’s durable, secure and has a large capacity. 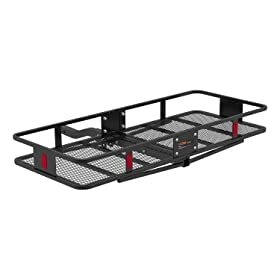 The Rambler Hitch Cargo Carrier is ideal for tailgates, road trips, camping, bulk shopping and any other purpose when you want to carry a large cargo. This carriage has a robust capacity of 500 lb on a 60-inch by 24-inch platform. It features 5.5-inches side rails to keep your valuables in place while enhancing security. A smart, rugged mesh floor makes clean-up and easy. Hence, you won’t face the pain of cleaning. It fits 2-inch vehicle receivers so you can use it with a variety of vehicles. The rise shank design elevates cargo to offer improved ground clearance. You will realize that this carriage is durable than normal brands. It features 2-piece construction with durable powder coat finish for durability. Also, this construction makes it resistance to elements, rust, and scratches. 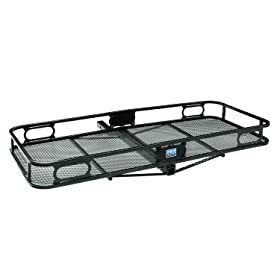 The Rambler Hitch Cargo Carrier may be all that you need for camping, roadside trips, and bulky shopping. Although it’s a bit costly, this carriage is long lasting, simple to mount, and offers plenty of clearance. Based on its outstanding features, this cargo carriage is worth the value of your money.